We’re writing this from the Miami airport - an hour after getting off the Symphony of the Seas, and we’re ALREADY having withdrawals. Now that’s when you know it’s been a good trip. 1. IT’S A FAMILY: We boarded the ship with a bunch of strangers, and we left feeling like family. We bonded with everyone from our hibachi server, to the ship’s captain (You’re the man, Captain Rob!! ), to the people we met in the waterside line. It is truly mind blowing how on such a large ship, you can quickly feel known. The RCI crew does a stellar job not only making sure every need is met - but also fostering a warm and fun-loving community. 2. 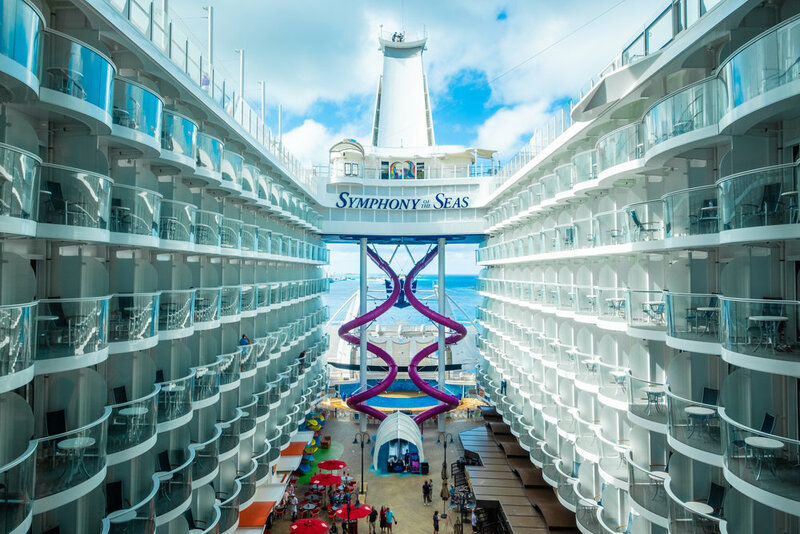 ENTERTAINMENT: We could dedicate a whole blog just to the quality of entertainment aboard the Symphony of the Seas. We saw a broadway production of Hairspray, Hiro (an “aquatheater” style acrobatic adventure show), 1977 (an ice skating show with incredible drone technology), and Flight (a Broadway style show on the history of flight) … How they do all of these shows at sea is crazy in and of itself, and then paired with the quality and talent of the performers it’s absolutely astounding. 3. TOP-NOTCH FOOD: Anyone that gives “cruise food” a bad rap has obviously never sailed with RCI. There are 20 different restaurants on The Symphony of the Seas, allowing your taste buds to give into any and every kind of craving. We had the opportunity to take a behind-the-scenes tour of the galley and see just how seriously RCI takes food. Every fruit and vegetable is checked for quality and every dish is prepared and presented with care and precision. 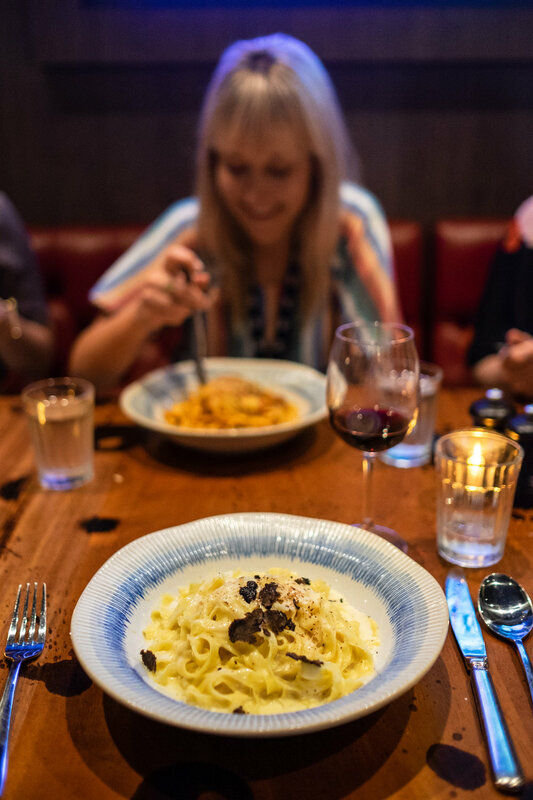 We were so inspired by the handful of chefs we got to meet, as every one of them is genuinely passionate about what they do. And it shows. 4. EFFICIENCY: Being such a large ship, one of our concerns was the crowds. We were bracing ourselves for long waits and long lines. How do thousands of people get on and off the boat efficiently, get their food served efficiently, or even find a seat at the bar? Well, we can gladly say that we NEVER had an issue with any of the above. From boarding the ship until disembarking, everything was done quick and orderly and pain-free. We’re not sure how the RCI crew handles all the logistics, but they do so flawlessly. 5. 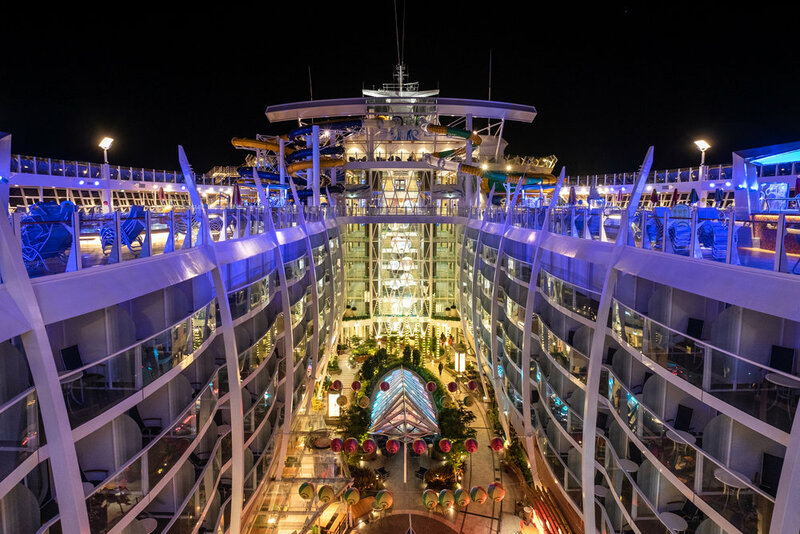 DESIGN: It goes without saying that The Symphony of the Seas is beautiful. 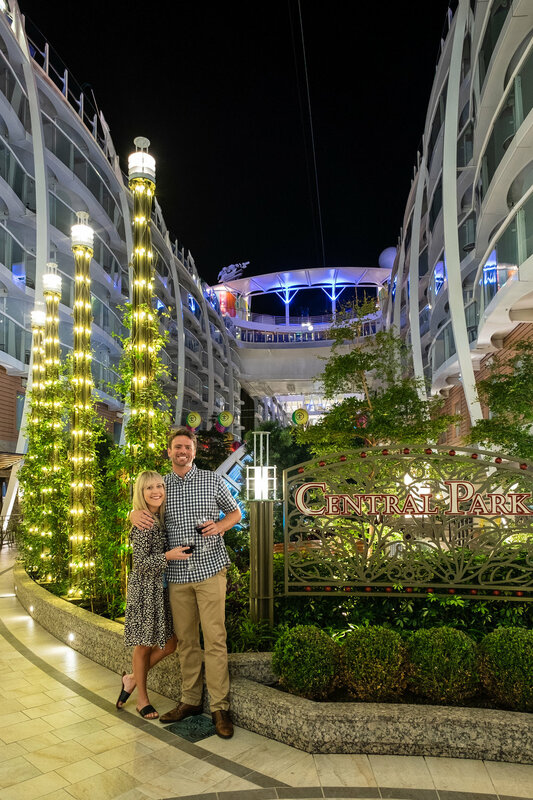 From the moment we stepped onboard, into the glistening Royal Promenade, we were in awe. (I think our jaws may have hit the floor.) Every room, restaurant, bar, and activity area is perfectly decorated in a sleek, modern, and welcoming way. Every theme was executed tastefully - from the serenity of Central Park to the hustle and bustle of Boardwalk. This is RCI’s tagline - and we absolutely love it. “Come Seek” embodies their very essence - adventure and discovery. Cruising with RCI isn’t simply a week at sea, it’s a week of discovery and exploration - both on and off the ship. No matter your age or your interests, there’s something for everyone. Take our (and RCI’s) advice and COME SEEK. We’re so glad we did. 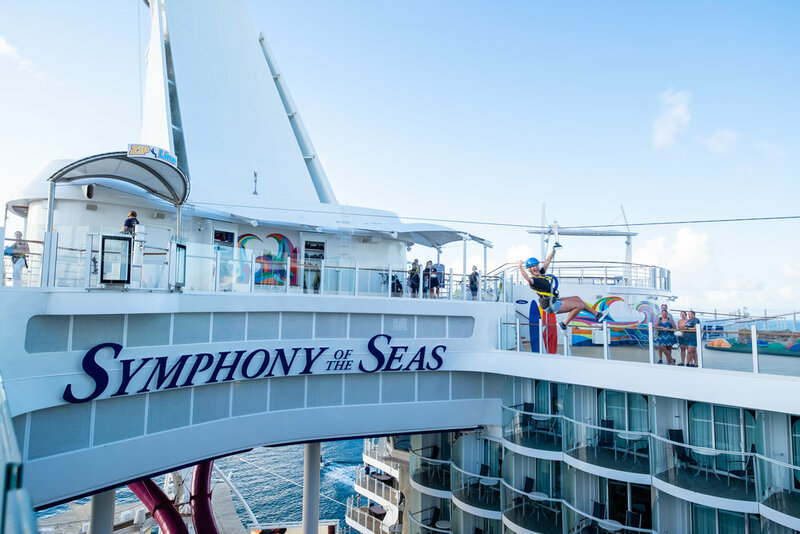 The Symphony of the Seas is currently sailing out of Miami, with week-long Eastern and Western Caribbean itineraries. Starting in May, you can experience “Coco Cay”, the exclusive Royal Caribbean Island in the Bahamas! Learn more and shop for your next cruise here. Newer PostTempe-ted To Never Leave!